I thought that winter was almost over, and that we had made it without a stay in the hospital. I spoke too soon...here we are in the cardiology unit of Boston Childrens for an unexpected stay. Evie started with a cough and runny nose, and just went downhill over the next few days. She started breathing rapidly and was crying frequently. We were told that if her oxygen saturation levels went down to 90%, that we should go to the hospital. I called Pediatrics and the nurse said to go to the ER, and offered to call me an ambulance. Evie was smiling and playing with her toys, so I figured driving in was just fine. I emailed the cardiologist and he agreed that we should go in. Here's Evie looking at her new accessory, aka hospital wristband. No wait in the ER! Woot! I was affirmed by the cardiology fellow for bringing her in. They saw her oxygen saturation levels dip a bit while we were there, and that won her a ticket to stay overnight for monitoring. Evie enjoyed the ride in Mommy's lap when they had me sit in the rolling hospital bed to be transported to the cardiology unit. She had a big smile on her face and waved to everyone. Daddy spent the first night with her, and since she's still showing some moments of low oxygen sat levels, Mommy gets to stay tonight too. Good thing we are veterans at this and it's more an annoyance than a big deal. The big difference this time is that we have a squirmy toddler on our hands. She is angry that she has an oxygen cannula up her nose, and that mommy and daddy aren't taking her where she wants to go. In fact, she's not allowed to leave her hospital room. Boo bronchiolitis!! I could go on about the inconveniences of hospital life, but instead I will talk about the nice parts. 1. Julian Edelman hands out pancakes to patients, apparently. The nurse told us AFTER he was gone past our room. I am still a bit peeved on missing out on a family picture with the Patriots player. 2. A music therapist. The neurology department has music therapists that go to the rooms and play music. The guy who came in had the most soothing voice. Unfortunately, his rendition of Itsy Bitsy Spider was so slow, that Evie didn't feel like clapping for him at the end. But she was definitely more relaxed, and I was too. 3. National pancake day celebration in the cafeteria! For 2 bucks, I got 3 pancakes with all the toppings I could want. They totally revived this tired mommy. 4. A play mat (aka a bunch of blankets) in the floor with toys from Child Life. 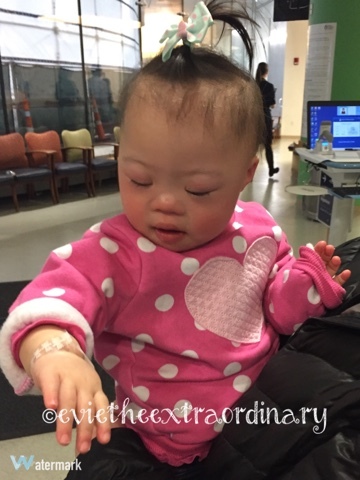 Evie was so sick of her hospital bed, so it was nice to give her some space to move around. With tubes everywhere, it's hard, but she likes it better for sure. 5. All you can drink ginger ale. I'm having an upset stomach, maybe from stress, but luckily there is all the ginger ale and apple juice that I can drink! 6. A 14 foot extension to the oxygen tube. I was annoyed that we couldn't take Evie more than a foot from her bed, and I said so. 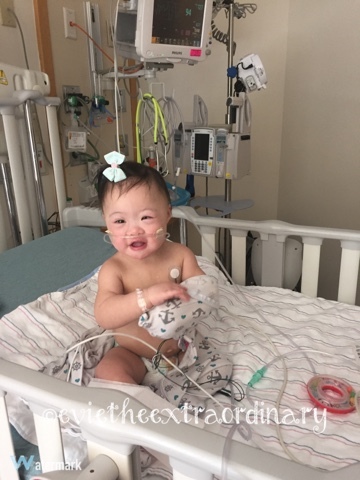 The nurse then brought some extensions, and that made so much of a difference in moving around the room with Evie's oxygen tube. I should have asked sooner! 7. Lots of books. Child Life has lots of books for Evie, so it's nice having some different ones to read. 8. All the baby food we need. Evie has a smorgasbord of flavors to choose from! She is just getting her appetite back, so she will be able to take advantage of this a bit more soon. Today, sweet potato was the winner. 9. Endless supply of oximeter sensors. Evie loves pulling off the little sensor that wraps around her toe. We had to ask for extra last year because she went through them so quickly. Luckily we have an endless supply here! 10. Awesome doctors. We are in the best Cardiology department in the country! For the praying type, Evie's oxygen levels drift down when she sleeps. We are on the lowest amount of oxygen, but she still needs it. Please pray that she won't need the supplemental oxygen and that we have physical energy amidst lack of sleep! Thanks to all of Evie's awesome fans!